Though for sports enthusiasts and professionals there is nothing unusual about getting baked in the sun yet their eyes and skin demand protection. Over exposure to sun can be fatal especially in the case of eyes. Therefore, it becomes essential to cover your eyes while you play outdoors. The best option is sports sunglasses. These glasses obstruct the damaging ultraviolet rays from hitting your retina and also do not allow harmful particles in air or water to come in direct contact with your eyes. With an increase in the temptation of outdoor sports and activities such as biking, rock climbing, kayaking, golfing, mountain biking etc., the market for sports sunshades has experienced a significant boom. As companies are finding it easy to sell their product, more and more designers and manufactures are lining up. The brilliant performance of the sports sunglasses and their large-scale promotion by well-known athletes and other sports' icons are also significant factors leading to the high sale value of these glasses. From top companies in manufacturing sports products such as Nike and Adidas to reputed brands such as Oakley, Roxy, Maumi Jim, Rayban, Angel, DSO etc. many have taken a successful dive in the sports sunglasses biz. . So we have a variety of options in hand that make the choice of right sunglasses all the more troublesome. Keeping in mind the situations associated with sports and other outdoor activities, the sports sunshades are a little different than the normal. They differ not just in their design but also in weight, flexibility, resistance, lenses etc. 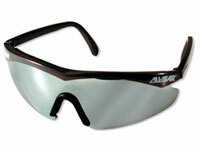 For instance the sports sunglasses are made of lightweight material which is also flexible and durable. They have a good grip and effective lenses. The lenses used in sports sunshades are quite strong and durable. The polycarbonate lenses are often used to make sports sunwear. This is because polycarbonate lenses are extremely strong and impact resistant. Similarly polarized lenses are also ideal for sports sunshades as these lenses reduce the glare which is produced on flat surfaces such as water or snow. Due to their optical clarity, glass lenses are also at times used in sports eyewear. Though nowadays we have particular sunglasses for each sport (be it swimming, golfing, rock climbing and the like), certain standard sports sun spectacles also work for all kinds of sports. As the old styles recede the new designs set in and the market is always in flux. However at present the preferred choices are sports sunglasses made of lightweight and durable frame materials like polyamide; changeable lens system that enables you to wear dark lenses under the sun, clear lenses in the dark etc. Polarized lenses along with stylish and sleek frames are also quite in.